Cathy Ambrose & David Frego and showcases the Glen Park Public School Children`s Choir. This up-tempo Swing / Grass song focuses on taking good care of your back, whether at work or play. It also highlights the thought that even Superman has learned to bend his knees when he's picking up things and take good care of his back. What safety is all about? Make it to first - That’s OK.
Third’d be cool - What can I say?! Will it be a Fastball? Knuckleball? Will it be a Spitball? Curveball? Can I hit it home? I’ve got a few tricks of my own. This delightful Rock and Roll baseball song / story mixes animated theater and voice overs and if you close your eyes, you can picture yourself at a fun filled baseball game. This animated Rock n Roll baseball song was inspired by a conversation I had with my son who played baseball in the Little League. It’s about developing good self esteem, embracing fair play, accepting the challenge and trying to do your best. Please let me now explain. Or offer me some peace of mind. I like to read, I like to write, Children's choir joins in. 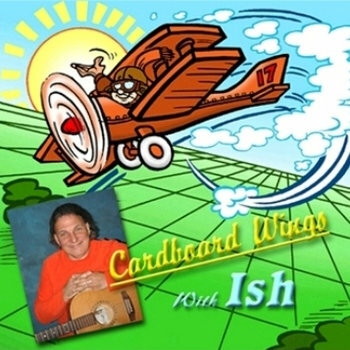 Ish added this little ditty when Cardboard Wings was originally released on Cassette. anymore it still brings a smile to the faces of the kids (grown-ups) who remember when. Shalev: So what did you think of that? Ashley: What did you think? Shalev: I thought it was great. Shalev: What do you say we turn the tape over and listen to the other side? 9 highly motivated Children and a Sound Effects Man reminiscent of Spike Jones, coming together to create an unforgettable recording about the Joys of Playing in the Rain. Go take a listen, you will be glad you did.